"One of the finest heritage hotels in Jaipur, Raj Mahal Palace in Jaipur is set in the backdrop of 15 acres of vibrant green lawns. Situated 170 km from Jaipur on the Jaipur-Kota highway, this property is an oasis of luxury, combining world-class comforts, old-world charm, and flawless Rajputana hospitality. One of the oldest and most-valued palaces of Jaipur, Rajmahal belongs to the Maharaja of Jaipur. A few years back it was refurbished and since then it has been one of the most popular luxury heritage hotels of Jaipur, offering a memorable stay to discerning travelers. Located in the heart of the city, this heritage property has plush rooms, suites and apartments. The various dining venues serve the best of food and beverages. 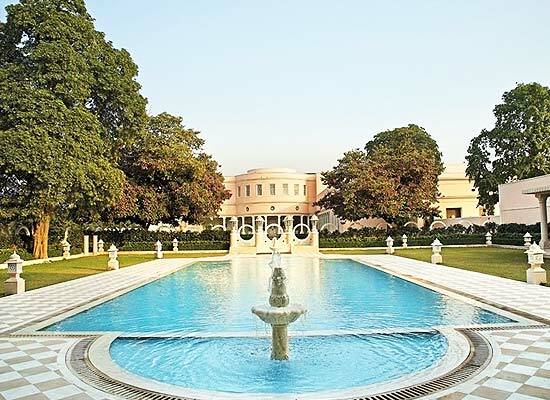 Commissioned by H.H Sawai Jai Singh II as a garden resort and a private palace for Chandra Kanwar Ranawat, his beloved wife, who was the daughter of the Maharana of Mewar, Raj Mahal Palace was a history of more than 250 years. Later in the years 1821, it became the official residence of the British Resident Political Officer of Rajputana. After this, the celebrated Maharaja Sawai Man Singh II of Jaipur made Rajmahal his private residence in 1958. During the course of its history, the palace has played host several dignitaries and VIPs such as Queen Elizabeth II and HRH, The Duke of Edinburgh, Jackie Kannedy, the Shah of Iran, Lord and Lady Mountbatten, Prince of Wales and Princess Diana, and more. Celebrated interior designer Adil Ahmad restored the palace in an amazing and unimaginable day, keeping intact the vintage charm and adding wonderful modern feel. The marble staircase, the massive chandeliers, are some of the original priced possessions here. Accommodation at Rajmahal Palace includes of capacious rooms, suits, and apartments that have been elegantly re-designed to fit the taste of modern travelers. Attention to even minutest of details such as fabrics and wallpaper has also been given. 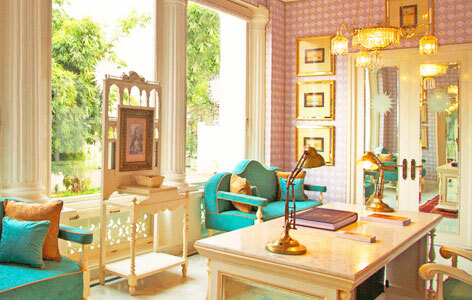 The colors, motifs, and design for all the rooms are different and inspired from royal Jaipur feel. The furniture used is antique too. Spread in an area of 3126 square feet, this apartment has 2 bedrooms, perfect for the kings and the queens. They originally were the private apartments of 2 successors of the royal owners: Sawai Man Singh II and his son Sawai Bhanwani Singh. A private entry hall takes you to the apartment, and you feel totally awed. A private terrace connected to a drawing room, a stylish living area, a separate bar are all a part of this apartment. The private dining room can easily accommodate 8 guests. The walls of this room are adorned with the portraits of the Maharaja of Jaipur. The main bedroom is huge and has an equally huge attached marble bathroom with a shower, a bathtub and his and her washbasins. The old-world regal charm has been clubbed with modern amenities. The suite of the apartment- the Yuvraj suite comprises of one bedroom, an attached bathroom with a dressing room and is located towards the entry of the apartment. Enjoy the services of a dedicated round the clock private butler and chauffeur service during your stay. Spread over an area of 2899 square feet, the Maharani apartment has a huge master bedroom, a sitting room leading to the dressing room, a modern private dining area, a capacious entry hall, fully-serviced kitchen and an attached bathroom. This apartment also consist of a heated plunge pool, and a private verandah. Enjoy the services of a Chauffeur and a private butler. Spread in an area of 1271 square feet, the Mountbatten suite is an elegant one bedroom suite that is filled with world-class conveniences and offering an unforgettable stay to the guests. This suite comes with an attached bathroom, a double bedroom, a drawing room, and a pantry. Covering an area 1530 square feet, this suite has been named after Queen Elizabeth II, who stayed here along with the Duke of Edinburgh, when they came to India during the winters of 1961. This suite includes a spacious double bedroom, an attached bathroom, a dressing room, a drawing room, dining room along with a separate double bedroom with bathroom. It is ideal for a family of four. 1024 square feet in area, the Kennedy suite has been named after Jackie Kennedy, its former guest, who stayed here in the year 1962. This room was her venue for as many as 3 months when she was in Jaipur. This suite comprises of a dining room, a drawing room, a dressing room, an attached bathroom and one double bedroom. Lying in an area of 938 square feet, the Prince of Wales Suite is a favorite of the Prince of Whales who has been a regular visitor, from many years in the past at the time of polo matches. A double bedroom, dressing room, and an attached bathroom are a part of this room. Spread over an area of 960 square feet, The Princess of Wales Suite has been named after Princess Diana. 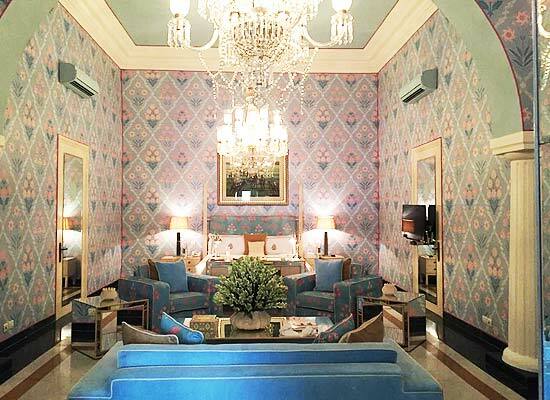 She stayed in this suite with Prince Charles when he visited Jaipur. The Suite comes with a double bedroom, a dressing room area, and an en- suite bathroom. The Residential Suite covers an area of 862 square feet. The palace was known to be the official residence of the British Resident Political Officer, the Agent General for Rajputana, from the year 1823 till the year of independence. It has one double bedroom, an attached bathroom, and a dressing room. Private suite of 2 successive Maharajas - Sawai Man Singh II and his son Sawai Bhanwani Singh, the Youvraj Suite, spread in an area of 647.6 square feet. The private entrance hall leads you to this opulent suite. This suite wonderful suite has a huge double bedroom, a dressing area, and an attached bathroom. 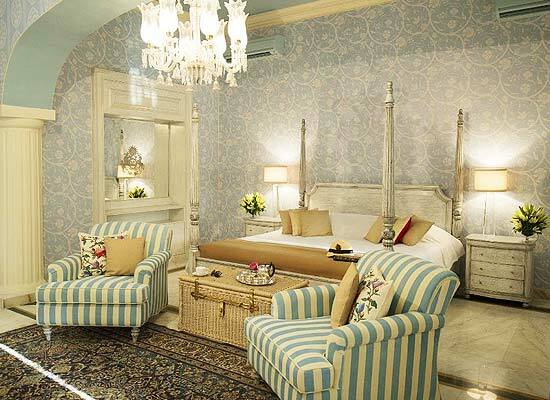 (Note: this suite can be booked only when Ram Niwas (The Maharaja’s Apartment) is not booked). One double bedroom, a dressing room, and an attached bathroom are a part of Madho Niwas I Suite that covers an area of 468 square feet. Spread in an area of 411 square feet, Madho Niwas 2 suite comes with a dressing room, an attached bathroom, and a double bedroom. Suk Niwas I has suite (342 square feet), a sitting room (538 square feet), and a verandah (382 square feet). The bathroom also has a dressing room. The double bedroom has all the world-class comforts. Suite (441 square feet), sitting room (538 square feet), and a verandah (382 square feet) are a part of Sukh Niwas 2. The dressing room and the attached bathroom is huge. Guests can have a pleasant stay in the well-equipped double bedroom. A round the clock dining venue, the Colonnade serves freshest of comfort food to its resident guests. While savoring your meal, treat your eyes to the lovely views of the well-maintained lush lawns of the property. There are certain timings for the non-resident guests. This chic and vibrant dining venue celebrates the colors of city, Jaipur, which is fondly known as the Pink. The décor of this place has been done in shades of pink, as even its name suggests. This is a special venue for breakfast as the meal becomes even more special when the rays of the fun flood-in from the mirrored spaces. A rather formal dining space, the Orient Occident is known for offer fine dining experience. It is frequently visited by Her Highness the Queen Mother, Rajmata Padmini Devi of Jaipur as the place is her favorite. The menu is an exhaustive one and has traditional recipes from the royal region of Jaipur. Along with some sumptuous food, if Polo is a games of your interest, then you should be here. 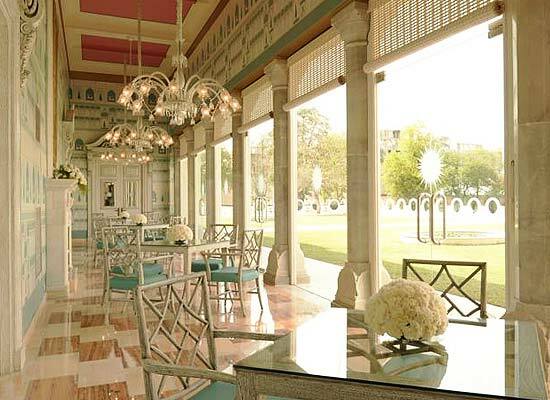 Along with being a wonderful venue for savoring special meals, this place displays several trophies won by the royal families of Jaipur on the polio field. Along with a vast variety of delicacies, the menu of this bar serves finest of beverages. Afternoon tea at the terrace and the manicured gardens of the Rajmahal Palace is a special affair, when the weather is pleasant. The vast menu includes of a selection of tea, coffer, some other drinks along with freshly-baked treats, including the favorites of the royal family. Jaipur, situated in the North Indian state of Rajasthan, forms the most preferred tourism golden triangle of Delhi, Agra and Jaipur. Popularly known as the Pink City of India, Jaipur is dotted with golden sands, magnificent forts, and charming palaces, mansions and gardens.